Make a little Design Magic! 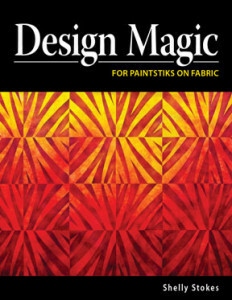 I know I’ve been missing in action here on the blog, but I’ve been totally immersed in finishing up my new book called Design Magic for Paintstiks on Fabric. The book went to the printer at the end of April, and I should have copies in my hot little hands sometime next week! And just in time for Spring Quilt Market. Whew! Welcome to the world of Design Magic. 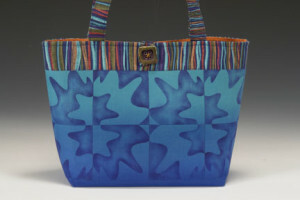 It’s a magical, mystical world indeed, where simple shapes are transformed into easy-to-use tools, and fabulous fabric is created in far less time than you ever imagined possible. It’s almost like having your own magic wand! And now that you’re here, I hope you enjoy the Design Magic adventure as much as I have. The path is full of exciting “aha” discoveries and “wow” moments. There’s never a dull moment in the world of Design Magic. * Create a design by cutting shapes from a square of black paper. * Make a set of equal and opposite stencils. * Stencil repeating images on fabric with paintstik colors and stencil brushes. The book includes complete instructions for making your own designs and stencils (of course), but I’ve also included a set of pre-cut mylar stencils for those of you who just want to jump in and paint. Here’s a picture of some fabric I’ve painted with the Primrose stencils that are tucked inside the back cover of each book. There’s way too much to tell you in a single post, so I’m not even going to try. If you want to see what else we are introducing at the Spring Quilt Market, jump on over to the New Products page on our website. We’ll be shipping the new books and stencils out to our retailers and distributors within 2 weeks, so you won’t have to wait too long to get your own personal copy of Design Magic.